The MS 450 SWIRLER is the solution for the mixing of lyophilized powder with Sterile Water for Injection (SWFI). Impact grinding of hard, brittle or non-elastic grinding materials with high-grade stainless steel beater. The new improved version of the laboratory bestseller with revolutionary technology and new functions. 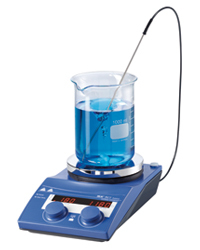 Our Laboratory products that are displayed in the Bargain Bin category are fully functional working products that have been shipped back or returned to Laboratory Mixers.com. These items are considered "open box" products. Some products are practically new and have never been removed from the box. - new: Hot Top indicator >> hot surface warning to prevent burns!